Towards the end of slog around Europe the six members of Okkervil River must be feeling like going home and having a break. They admitted to having been a while without a shower and their clothes had a distinct air of being ‘well loved’, but you don’t go to see a band for outfits, you go for the music. A bit of a johnny-come-lately to OR, their latest album is however right up there in my best of the year list. It’s considerable charms have wormed their way well and truly under my skin. Part of the allure is that style they have; its not slapdash or un-together, but neither is it pinpoint sharp all the time. There is this sense that they are somehow in charge of a beast they haven’t quite tamed, a force slightly beyond their control, this feels clear in the recorded material but proves even more so in a live situation. The variety of assembled instruments around the stage necessary for six people doesn’t leave an awful lot of room, but Will Sheff careened around the stage, perhaps encouraged by a couple shandies, in a mixture of musical elation and the determined effort to create the moment, capture the spirit. The band of course is top notch, including the beguiling Lauren Gurgiolo in her laced up boots and cotton dress straight out of a spaghetti western, wielding her guitar, the arboreally statuesque Patrick Pestorius on bass and the revelatory Cully Symington, like a thing possessed on drums. A ninety minute set peppered with the new material (Huzzah for the likes of We Need a Myth, Wake and Be Fine etc) it also contained much previous stuff as well, along with a Beach Boys cover and a solo moment from Mr Sheff delivering A Stone. To be honest I didn’t expect them to be so, well, straight ahead rock, the later numbers really went for it. My frankly rather dismal attempt at capturing A Stone is embedded below (usual apologies for rubbish sound and dark setting), a much better quality video of another song from the recent Cafe de la Danse gig in Paris is also shown below – many thanks to the fine Virgins and Philistines blog which you should pop off and read and see the extra photos on rotation there. Finally worth reading is the interview by Gold Flake Paint with Will Sheff prior to the Bristol gig which is interesting and well worth reading (along with the rest of the zine). 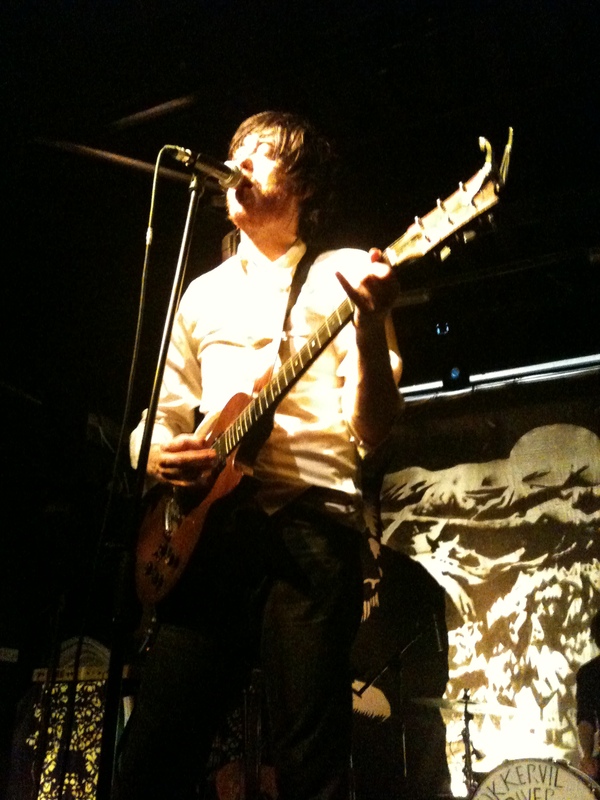 This entry was posted in Uncategorized and tagged Gig, Gold Flaked Paint, Okkervil River, video, Virgins and Philistines, Will Sheff. Bookmark the permalink. Hey thanks for the mention again! We’ll have to synchronise our gig schedules!